Today, over 100 women leaders from around the country are in Washington, D.C. for We Belong Together's women's lobby day. This marks the beginning of a week of action to mobilize thousands of people around the country to call on Congress to push for immigration reform that will be fair for women. Among the women gathered in D.C. are five Jobs with Justice leaders from Missouri, Georgia, and Florida. These women know from their work in their local communities that we are all better off when our communities are healthy and strong, we feel safe, and our children can thrive. They will be talking to their Senators about the need for an immigration process that ensures women are treated humanely and fairly, and can bring all of their many contributions and talents to strengthen our culture, economy and communities in America. 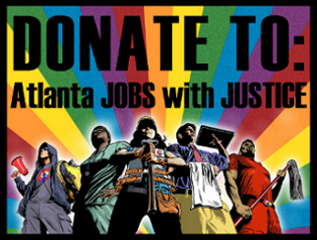 KEEP THE DATE: 7/27 JwJ Summer Fundraiser!